All our services can be given as a practical and original gift. The recipient will receive a package from us with a gift card for our services. You can give the experience of a personal shopper with our gift pack. Give the gift of a personal shopper experience! We’ll send the gift pack at no additional cost to the address of your choice. Do you want to give the gift of a personal shopper experience? 1 – You can purchase our gift pack or any other service by checking the box marked “Send as a gift”. .
2 – Enter your billing information and check the box marked “Address to send the gift”. 3 – Fill in the shipping address for the gift. You can send it directly to the recipient or send it to yourself so you can give it to them in person. 4 – Pay for the service safely through PayPal. The gift will be delivered within two business days. Remember that our services are for Madrid only. What should I do when I receive a gift? 1 – Enjoying our personal shopper services is very easy! 2 – You can book the date and time by sending an e-mail to contact@emiliadehavilland.com or by calling 918 053 892. 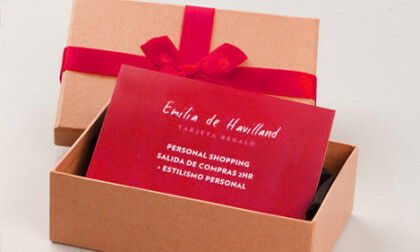 3 – Remember that our personal shopper gift services are for Madrid only.